Miqui Otero is a novelist, a journalist and a key figure in Barcelona’s underground scene. For years he ran chaotic DIY record companies, film and music clubs and literary fanzines. Nowadays he contributes to newspapers and teaches Literature and Creative Journalism at the university. His acclaimed first novel, Hilo musical (Alpha Decay, 2010) was awarded Fnac’s New Talents prize and was followed by La cápsula del tiempo (Blackie Books, 2012), a unique story-telling venture, a novel made out of 37 stories, inspired by the Choose Your Own Adventure books that became an indie best-seller. 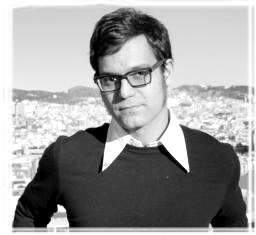 His latest published work is the novel Rayos (Blackie Books, March 2016), considered by the critics “one of the great novels of Barcelona” and currently being adapted into a television series by Omicron and Netflix.